Welcome to Julian Rogers Auto Services in Gloucester. We are a friendly family run business which has been trading for over 25 years. We believe in quality workmanship at a fair price. Our fully qualified technicians have experience of working on all makes of vehicles with the assitance of the latest diagnostic equipment. As member of the FSB, we provide for all of your motoring needs and for all makes and models of vehicle. With full workshop facilities, Julian Rogers Auto Services in Gloucester is able to provide the best possible service for your vehicle. You'll always receive the best possible advice when you put your car in our hands. With Julian Rogers Auto Services you are guaranteed the best... check us out on the Best of Gloucester website and see testimonials from some of our current customers. Welcome to Julian Rogers Auto Services. 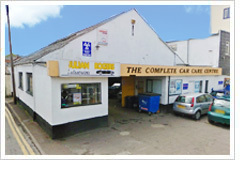 We are a local, independent garage, serving Gloucester and the surrounding areas.